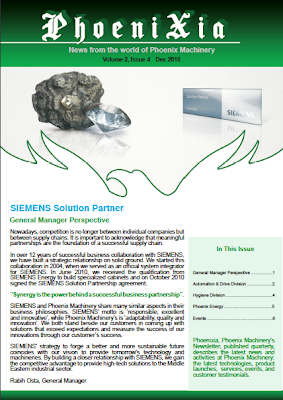 Download the December 2010 Phoenixia newsletter, featuring articles about Phoenix Machinery’s recent developments and latest events. Phoenix Machinery, in Safra, Lebanon, manufactures machinery and new equipment, as well as refurbishes and performs control upgrades for high precision CNC parts, in addition to paper, plastic, tissue, and hygiene machinery. The fourth issue of Phoenix Machinery’s 2010 quarterly e-newsletter consists of the latest articles relevant to new developments, signed contracts, customer testimonials, and events.